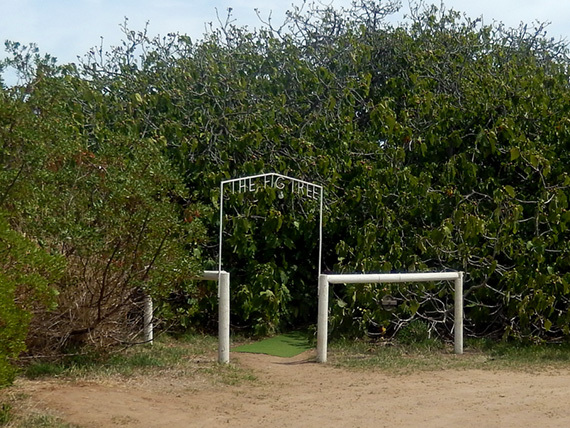 Enchanted Fig Tree Restaurant: One of the most unusual and one of the very best restaurants we ever dined in. Alex and I have traveled to nearly 70 countries. 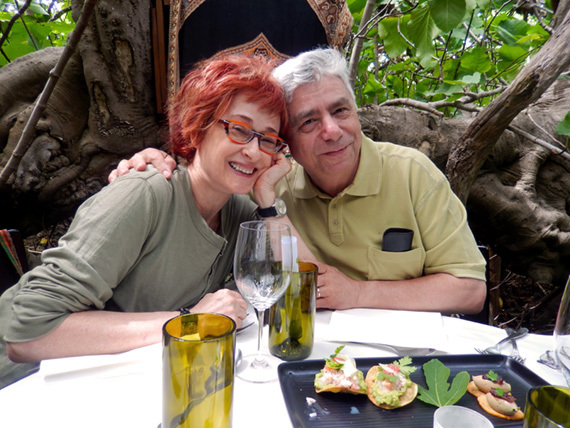 We celebrated our birthdays and anniversaries in places like a street corner café on Easter Island, tiny seafood restaurant in Cochi, Kerala, a second century BC villa –turned Renaissance palace-turned art studio in Rome; opera singers’ favorite tavern in Palermo near the famed Teatro Massimo, just to name a few. But we had the most unique experience this year on March 5th, when our new friend Steve Lane, Kangaroo Island’s Sea Dragon Lodge owner and our exceptional guide, took us to the remote Snellings Beach on the north coast. 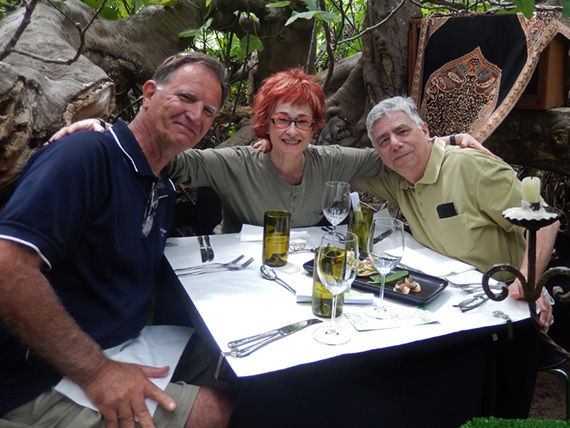 As a present on our milestone wedding anniversary, Steve invited us for a luncheon inside a… tree. The brain-child of two extraordinary chefs Rachel Hannaford and Sasha Sachs, this pop-up restaurant is called (how else?) 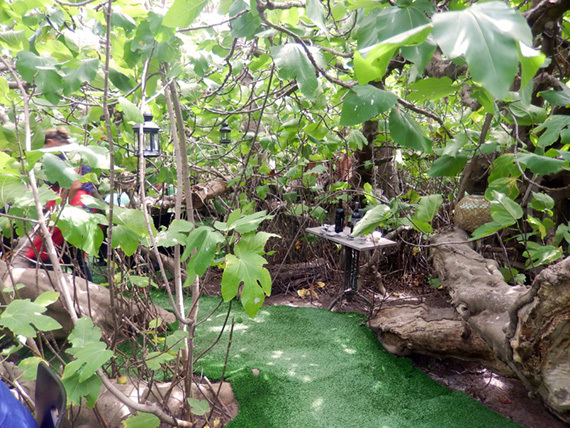 “The Enchanted Fig Tree” and is indeed located inside a 150-year-old fig tree on the Hannaford family’s property. Between the mighty tree roots and under its enormous canopy, there are five distinctive large spaces, called “rooms” by the owners. The lucky ones to get reservations, about 30-to- 40 people, sit in these “rooms” by elegantly set tables adorned with white table clothes and candles. Each table is placed in a nook of a sort that looks and feels like a private party room among the leaves and boughs of that tree. Thanks to our friend, on March 5th we were the ones “chosen by the tree” in a room for three people. Outside the tree, the enchanted world inside is not visible: all is covered by a great canopy. We felt we entered the Shakespearean Arden forest. Our meal was a tasting menu based on the best of island produce. It happened to be nothing short of a marvelous symphony composed of taste sensations, textures, shapes, and colors. 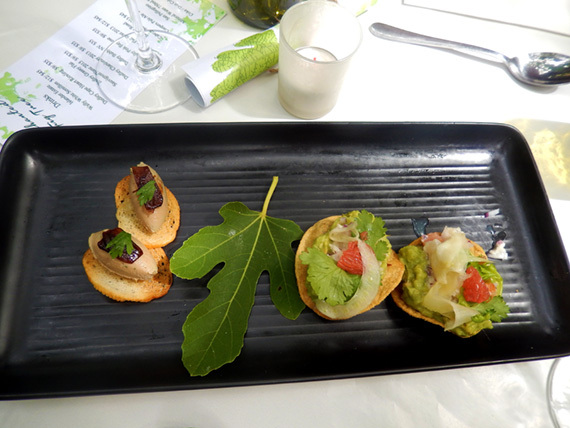 The appetizers – Carpaccio of local fish with homemade totopos and liver parfait with agrodolce and paper thin sourdough wafers, also homemade – were out of this world. As an entrée, understood in Australia as a first course or a starter, I chose Mexican-inspired pozole made of white chicken broth with lime, avocado, chili and corn, which was excellent. Alex had wild mushroom galette: Sasha Sachs’s secret recipe puff pastry with local mushrooms on a watercress salad with parsnip puree. It seemed to evaporate from his plate, even before I wanted to ask for a taste. Instead of the main dish, we were treated to a real banquet, a Greek themed variations of taste. 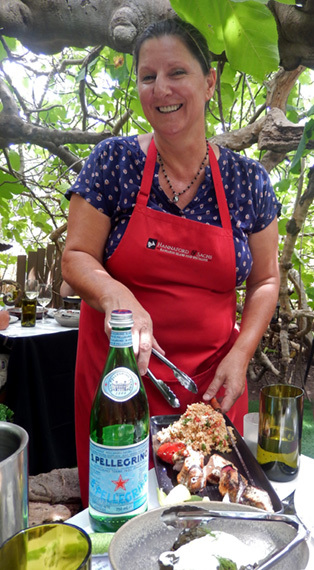 Local lamb with sofrito dolma was followed by a fresh grilled local fish with marjoram and vegetables. 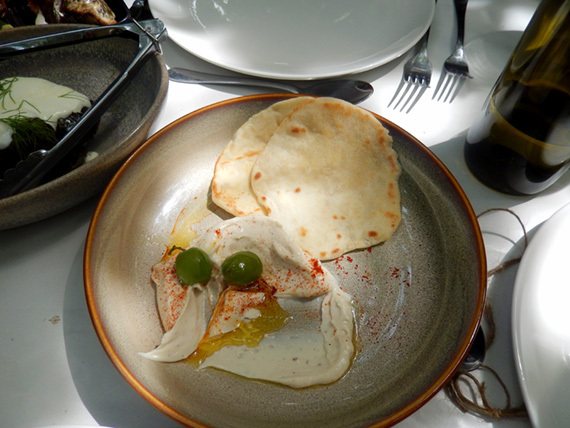 All was accompanied by Sasha’s wonderful taramasalata and quinoa salad with Kangaroo Island’s sheep cheese, pureed with roasted fennel. The knock-out crescendo of this concerto was a divine desert: raw sugar meringue with figs from the tree inside of which we were eating! After the meal, we met the owners, Rachel and Sasha, to express our feelings of owe and admiration. 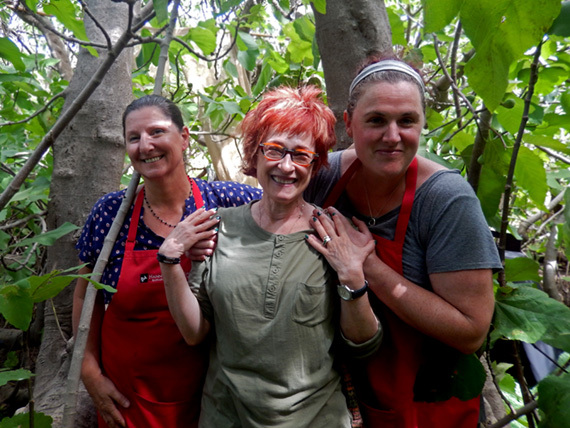 When I told them that they are amazing food artists, these talented chefs, two extraordinarily women, seemed surprised. They just do what they love to do: creating an unforgettable experience and thus enriching lives of everyone they host in their magic forest. Thanks to Steve, we had one of the most memorable celebrations! 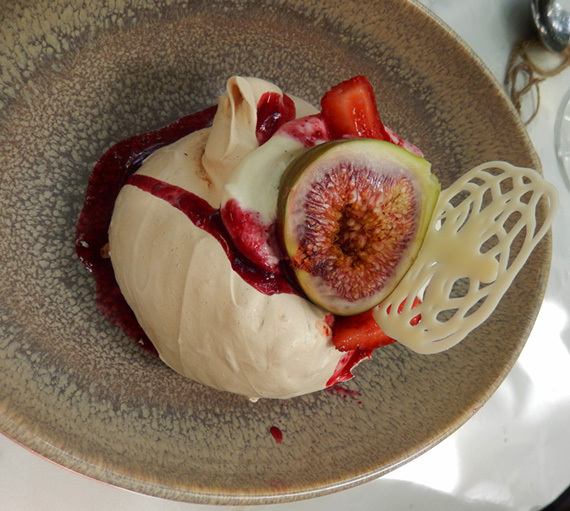 The knock-out crescendo of this food concerto: a divine dessert made of the raw sugar meringue with figs from the tree inside of which we were eating! This entry was posted in Australia, General, Nature, Travel Tips and tagged Australia, eating out, Kangaroo, Kangaroo Island, restaurant, travel, travel tips, tree, vacation. Bookmark the permalink.